Disclosure: Thank you to The Coffee Bean & Tea Leaf® for sponsoring this conversation. Teachers are so important in our children's lives. They shape and form the foundation for their future and it is important to recognize their great efforts on National Teacher Appreciation Day (Tuesday, May 5, 2015). Kenzie has had some amazing teachers at her preschool for several years and one gift that I have consistently given (throughout the year as well) is The Coffee Bean & Tea Leaf gift cards. No one knows better than parents how much work it is to take care of our children. Imagine having an entire classroom to take care of during the day while you are at work? I've only experienced glimpses when accompanying Kenzie on field trips and oh boy - it's a lot of work and requires significant patience. 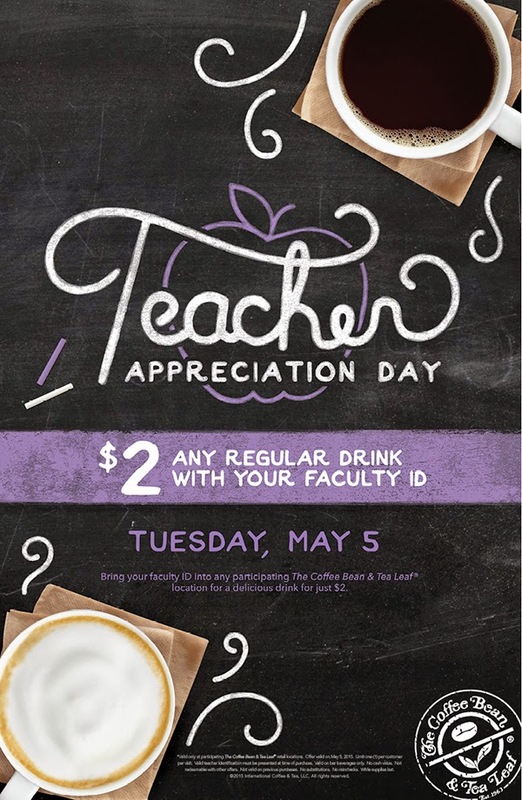 In celebration of National Teacher Appreciation Day, The Coffee Bean & Tea Leaf (Southern California’s iconic specialty coffee and tea retailer) is inviting teachers and faculty members to receive any 16 oz. beverage for only $2! This offer* is available all day at participating Arizona, California, New York, Connecticut and Austin area store locations. I love the specialty drinks offered at The Coffee Bean & Tea Leaf (they have the best Matcha Tea Latte) and will be picking up several gift cards for Kenzie's present and past teachers at her preschool. I even gift one to her school principal! Since Mason will be starting preschool this summer, it's always nice to be generous to his future teachers right? The baristas at The Coffee Bean & Tea Leaf, upon request, will give you cups/lids so that you can place the gift card inside and add a thoughtful hang tag/name tag. Super quick and easy gift that you can easily grab in the morning before dropping off your child if you have not prepared beforehand. The first year was the cutest when a teeny, tiny Kenzie carried a tray full of "coffee cups" for her teachers. Do you spot your child's teachers with the signature purple straw from The Coffee Bean & Tea Leaf? Will you be celebrating National Teacher Appreciation Day on Tuesday, May 5, 2015? 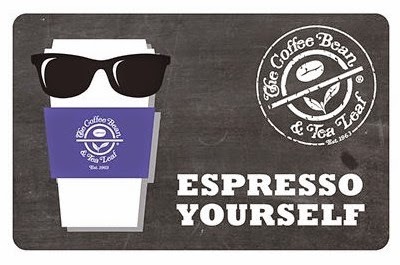 *Valid only at participating The Coffee Bean & Tea Leaf® retail locations. Offer valid on May 5, 2015. Offer for one (1) Regular size beverage for two dollars ($2.00). Limit one (1) per customer per visit. Valid teacher identification must be presented at time of purchase. Valid on bar beverages only. No cash value. Not redeemable with other offers. Not valid on previous purchases. No substitutions. No rain checks. While supplies last. ©2015 International Coffee & Tea, LLC. All rights reserved. How great that this coffee shop is giving a shout out to teachers! If anyone deserves it, they do! As a teacher (on leave now to be home with kids) I can say that I always enjoyed receiving coffee/tea gifts and giftcards. Great idea! I'm glad that you posted this. This year is my child's first in school (preschool) and he LOVES his teacher. We appreciate her and now I have a better idea on how to thank her and show that appreciation! What a fun way to celebrate Teacher Appreciation Day! Thank you so much for sharing! Great ideas! I had no idea this day was coming up and I truly appreciate everything my son's teach do. And I'm sure they would love a gift like this much better than an apple! That's a great price on coffee and a great way to celebrate teachers! I hope everyone will say thank you to their teachers and that all the teachers will get a great cup of coffee! Yay! My hubby is a teacher and I can say without a doubt that they deserve a little treat. Thanks for sharing! We don't have The Coffee Bean & Tea Leaf but I bet that's a big hit! We do flowers and gift cards and they always seem to be well-appreciated. Our school's PTO will be bringing in items each day for teachers to enjoy. Each day has a theme. I think that a teacher appreciation day is so awesome. Our teachers need to be spoiled once in a while.